At our October meeting, Glen 'Catch' Cormier gave a presentation on "Fly Tackle for Saltwater and Bass". He pointed out the next 5 months is the best time to catch large speckled trout and bass on the fly rod, and because of clear water in winter, the best sightcasting opportunity for redfish. What does it take to get started, and what flies should you have? Here are several notes from that presentation, including some tips on leaders and knots. The next meeting of the Kisatchie Fly Fishers will be on Monday, October 28, 2013. This meeting is open to the public, and all are invited. 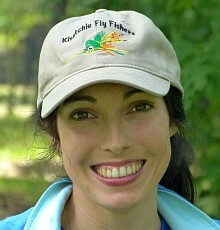 Catch Cormier will give a presentation on "Fly Tackle for Saltwater and Bass". With peak fall fishing for reds and specks almost here, and bass feeding to build winter reserves, there's never a better time than now to catch these species (and others) on fly rod. Catch will discuss tackle, flies, techniques, and even a few prime fall spots for using the long rod. What is Rendezvous? Twenty-five years ago, a group of fly fishermen from Texas, Louisiana, Arkansas, and elsewhere decided to get together for a weekend to fish and tie flies. They found the facilities at North Toledo Bend State Park to be ideal. Since then, the tradition has continued and grown. There's no planned activities, but plenty of fly tying, food, fly casting and fishing, with only a minimal fee to cover lodging and meals. The activities take place at the park's group facility, which features a commercial kitchen and dining hall, and lodging available for up to 150 people in 5 heated log bunkhouses (30 beds each). There's also a heated central shower and restroom building with nice night lighting on all the sidewalks and a large main log building with A/C, picnic tables and a large barbeque trailer.